Feeling overwhelmed by “stuff?” Unused and unwanted possessions tend to accumulate so much that it becomes an overwhelming burden when it’s time to move. In fact, the average U.S. household has 300,000 things. Imagine moving 300,000 things to another home. Even more concerning, the average American throws away more than 68 pounds of clothing per year, clogging up landfills at an alarming rate. And that is only clothing; consider everything else homeowners typically toss in the trash. 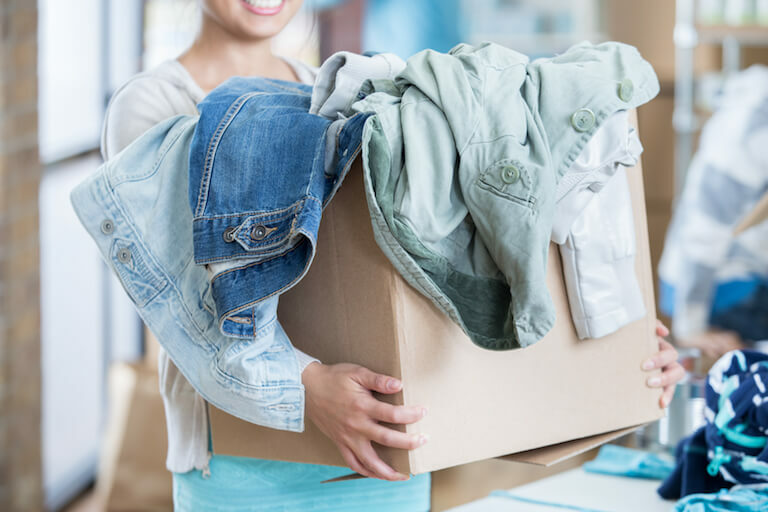 Donating your used items is better for the environment, and if you choose a charitable organization, your donations even help someone in need. 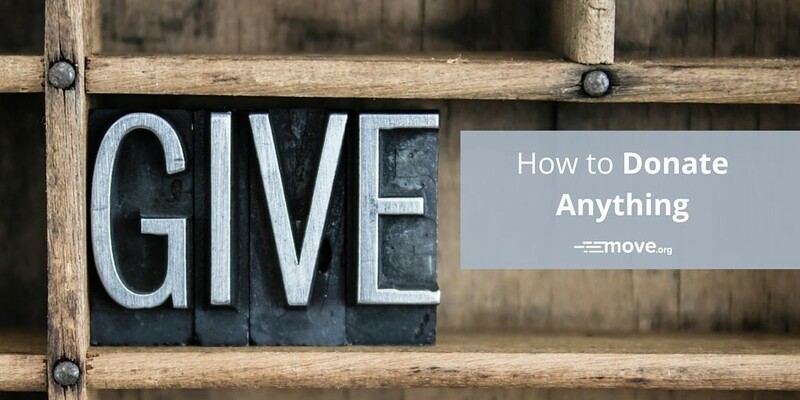 We’ve made the process simpler for you by giving you the resources to understand what you should or can donate, the tax deductions you can use, and a list of where to donate specific items. Before donating, take the condition of the item into consideration. Only donate items that are new, unused, or “gently used,” which means items that are in good condition, clean, and presentable. Do not donate items in disrepair that don’t work properly, are missing parts, or are ripped, torn, or stained. If you can’t use the item in its current state, neither can a charity. Donating cash to your charity of choice helps you give money to those who you believe need it most. Using auction and classified websites such as eBay or Craigslist, holding a garage sale, or using a consignment shop are good options to sell your items. When you donate cash you know the exact amount to report to the IRS, as opposed to using the valuation (we’ll cover valuation next). Check with your tax professional for advice, but know that donated items are usually tax deductible. If you want a tax deduction for donating used items, you need to get a donation receipt, and you’ll have to value your donations. Make a list of all of the items you donate, and attach the receipt you receive from the charity. Retain the receipt for your taxes. If you are audited by the IRS, you don’t have any way to prove you donated the items if you don’t have a receipt. The value of the donated items depends on the item and its condition. Use the current fair market value to determine the valuation. Items must be in good condition or better for you to use the deduction. Goodwill and The Salvation Army both offer Donation Value Guides. The IRS also offers a publication to help you better understand the guidelines for donating used items. Charities must be registered with the IRS as a 501c(3) tax-exempt organization for your donated items to be tax deductible. You can check a charity’s tax status at irs.gov/eo/; or by calling 877-829-5500. You can also perform a background check on a charity at sites such as Charitynavigator.org, Charitywatch.org, and (the Better Business Bureau). Use Kelley Blue Book to get an estimate of your car’s worth, but keep in mind that you may not deduct the full blue-book value of your car if it’s in poor condition. The IRS also requires an independent appraisal when the value of an item is more than $5,000. Find an appraiser through the >>American Society of Appraisers. Sells donated items, and in turn helps individuals find jobs and develop job skills. They accept clothing and accessories, electronics, household goods, furniture, books and multimedia, and more. Sells donated items and uses funds to help children and families, the homeless, veterans, and others in need. They accept clothing, furniture, and other household goods. Offers free pickups. Provides support for at-risk youth, those returning from prison, the homeless, the disabled, and those struggling with addictions. Accepts clothing, household items, and other used goods at their thrift stores located in various cities throughout the US. Provides resources for individuals to secure and maintain employment. Donate gently used professional apparel to one of their locations in the US. Provides professional attire and career development tools to women in need. Accepts new or nearly new suits, other business-appropriate apparel, shoes, and accessories like handbags, unused cosmetics, and jewelry. Affiliate locations are located in several cities across the US and internationally. Animal rescue organization that accepts donations of jewelry only. Jewelry can be mailed to the address provided on their website. Holds coat drives nationwide every fall and winter to help local charities give coats to those in need. Coat drive drop-off locations are listed on their website. Concentrates on sustainable development projects in Africa, Asia, and Latin America. Accepts good-quality clothing for their domestic thrift shops located throughout the US and sells clothing to overseas customers where they can be resold, creating jobs and providing a source of affordable clothing. Lesser-quality clothing is sent to recycling centers and repurposed into other things. Collects new and gently used shoes and clothing and distributes them to those in need. Take clothes and shoes to a nearby drop-off location or ship them by purchasing a shipping label directly from their website. Gives dresses to military brides. Accepts gowns fewer than 5 years old, and in some cases accepts vintage gowns. Also accepts veils, tiaras, and accessories. Provides formal dresses and accessories at no cost to Chicago-area students who are unable to purchase their own prom attire. Accepts new and gently used formal gowns and accessories, including shoes, purses, jewelry, and unused makeup. Most are in need of gently used toys, games, and children’s clothing. Contact your local women’s or family shelter. Donates Night Night packages to homeless children ages 12 and under. Each package contains a new security blanket, an age-appropriate children’s book, and a stuffed animal. Primarily accepts new items, but check their website for guidelines before donating. Houses families of sick children who are hospitalized. They accept donations of toys, games, and media to stock their houses and entertain families. Contact your local Ronald McDonald House to find out their specific needs and how to donate. Accepts various items including stuffed animals, coloring books, books, crayons, blankets, children’s clothes, and baby-related items. These items benefit children during situations such as fires, accidents, illness, neglect, abuse, homelessness, and weather emergencies. Donations are accepted at their chapter locations. Provides free communication services and funding to serving troops and veterans. Donate gently used or new cell phones and tablets at a drop-off location or mail them to the organization. Provides video game systems and games to children’s hospitals worldwide. Send new and used games, consoles, and accessories to their headquarters. Collects computers and other office equipment and donates refurbished computers to charities, organizations, and schools. Donations can only be received in certain cities. Check their website for details. Donations provide resources for domestic violence organizations and programs worldwide. Donate wireless phones and accessories at your local Verizon store or print a pre-paid mailing label from the website. Recycles used cell phones and uses the funds to purchase Lifestraws (a portable water filtration system) for those who don’t have access to clean water. Fill out a form online to receive a postage-paid label. Provides services to assist survivors of domestic abuse. Donate cell phones, laptops, MP3 players, digital cameras, and video game systems. Most items are refurbished and resold; proceeds support the organization’s services. Provides organizations with technology to help low-income individuals, those with disabilities, and at-risk students. Accepts computers, software, printers, and other technology. Use the Non-Profit Locator on their site to find a drop-off location. Provides refurbished used computers to organizations in developing countries. Drop off your working computer at a local chapter or mail it to their headquarters. Sends used bicycles and parts to organizations in developing countries. Accepts bicycles, bicycle parts, and accessories at drop-off locations, through bike shop partners, and at scheduled collection events. International program promotes health and fitness by providing running shoes to those in need in the United States and throughout the world. Donate running shoes at drop-off locations throughout the US or mail shoes to their main location. Provides soccer supplies to communities in need. Accepts most types of soccer equipment, including balls, pumps, jerseys, shorts, soccer socks, soccer cleats, ball bags, and more. Peace Passers connects those with gear to groups that ensure the items are used. Most charities only accept specific types of books, particularly those most relevant to the organizations to which they donate. Always check their website first for guidelines before sending books. Sells books through its website and uses the funds to support literacy programs. 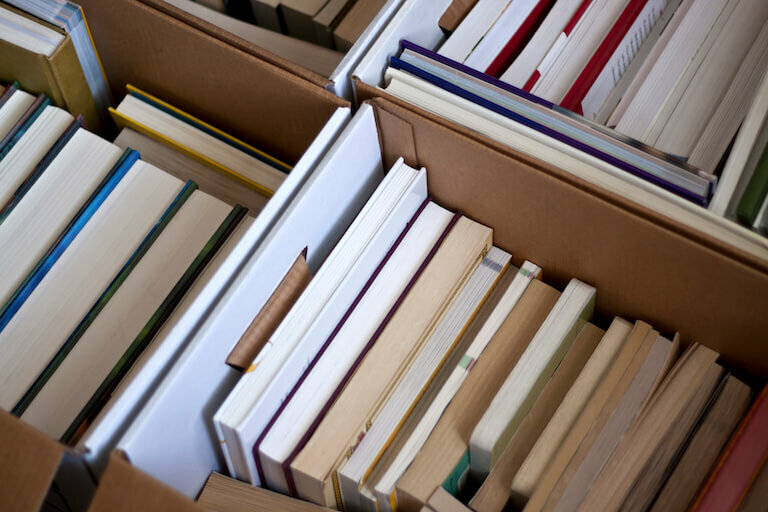 Shipping is free of charge for shipments of three books or more, or you can drop off books at one of their Book Bins. Ships books to schools and libraries in Africa. Donations are accepted at one of their warehouses or via mail. Books are donated to libraries, schools, and other organizations all over the world. Accepts a large range of books. Sends books to troops overseas. Sign up on their website to become a volunteer shipper and request addresses to send your books to troops overseas, veterans, or military families. Offers a database of local charities that pick up furniture for free. Offers an online forum where people give away goods, including furniture. Offer your furnishings on the site as a way to give to someone who may not be able to afford them otherwise. Donated furniture funds their resale store, and you can use the Goodwill Locator to find a drop-off center. Owned by local Habitat for Humanity organizations. Proceeds from the ReStore are used to help fund local and national Habitat for Humanity housing programs. Accepts new and gently used furniture at local store locations. Provides furniture to 100,000 families in need each year across the United States and Canada. Their website includes a list of local donation centers. Many centers will pick up the furniture from your house. Salvation Army stocks furniture in their resale shop. Locate a drop-off center on the Salvation Army website. Homeless shelters provide housing and food to those in need and often accept furniture donations. Your local United Way can provide you with a list of homeless shelters in your area. Sometimes they are in need of furniture donations. Contact your local women’s or family shelter. Many charities with resale shops accept working small appliances. They also may accept larger appliances, but their policies vary at each location. Check with your local store. Donation website where you can post your available items, including appliances, and you are connected with nonprofits and charities seeking the items you are offering. Works to prevent and cure diabetes and improve the lives of those with diabetes. Accepts cars, trucks, boats, and RVs. Provides a mentoring network where adult volunteers develop positive relationships with children 6 to 18 years old in communities all across the country. Accepts cars, trucks, SUVs, motor homes, boats, airplanes, farm equipment, and construction equipment. Builds and rehabilitates homes to provide housing for families in need. Accepts cars, trucks, boats, and other vehicles. Dedicates their efforts to the awareness, prevention, and treatment of kidney disease. They accept donations of cars, trucks, vans, boats, motorcycles, motocross bikes, power sports equipment (such as ATVs), off-road motorcycles, construction equipment, personal watercraft (such as Jet Skis), and farm equipment, including tractors with a serial number. Offers a variety of nationwide programs for wounded soldiers, veterans, and their families. Accepts car, truck, boat, and RV donations. Often accepts vehicle donations including boats, but not all types of vehicles are accepted at all locations. Check with your local Salvation Army first, or call them at 1-800-SA-TRUCK (1-800-728-7825) to get more information about vehicle donations. Provides support for at-risk youth, those returning from prison, the homeless, the disabled, and those struggling with addictions. Donate your car, truck, boat, or RV. Pickup is free. You may be able to donate your used car for use in the school’s auto-repair classes. Contact the school directly to discuss their needs. Freelance Writer, Website Producer. Former landlord/house flipper. 3 time homeowner. Happily producing content from the comfort of her home (or hotel). Avid traveler. Loves music and the ocean, human/animal/earth rights advocate. She's written for such media powerhouses as USA Today, but considers her biggest accolades the two young people who call her mom. I have books that I collect for free every where I go, but, can’t afford to mail to those in the United States Armed Services. What could I do to get help mailing the books to troops? I would call military type organizations such as the USO and Purple Heart and ask them for guidance. My guess is they would be able to best guide you on if such a donation program exists, and if so, the best way to go about doing so! I have a friend who is leaving her husband. I’m moving and want to donate some furniture and things to her to get settled. She can’t afford to buy them. How can I give them to her and get a tax receipt? If you’re donating things directly to her, you wouldn’t be able to get a tax deduction for it, unless she were a 501(c)(3). In her case, you’re just being a great friend and helping her out. If you want a tax deduction, you’d have to donate the items directly to a 501(c)(3) – like Goodwill or Salvation Army – and then she’d have to go to their store and see if she can buy your items from them before someone else gets to them.